18020 ND SOMALI COAST (1902) Somalis on camel*. Imperforate block of 4. Scott No 44, Yvert No 48. 18132 ND SOMALI COAST (1902) Tadjoura mosque*. 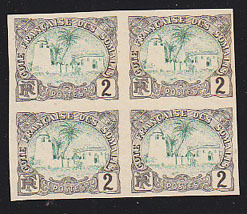 Imperforate block of 4 in unissued colors. Scott No 35, Yvert No 38. 4551 ND SOMALI COAST (1956) Map of Djibouti*. Somali woman*. Margin imperforate. Scott No C20, Yvert No PA25. 10197 ND SOMALI COAST (1958) Haemanthus*. Imperforate corner block of 4. Scott No 270, Yvert 290. 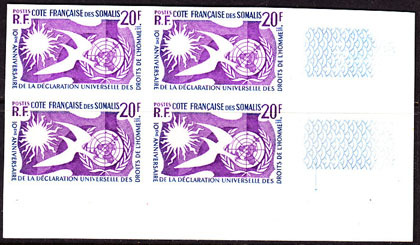 11782 ND SOMALI COAST (1958) Human Rights 10th anniversary. Imperforate corner block of 4. Scott No 274, Yvert 291. 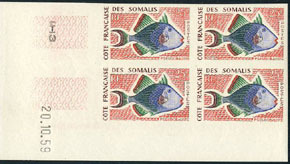 16115 ND SOMALI COAST (1959) Pseudoballista*. 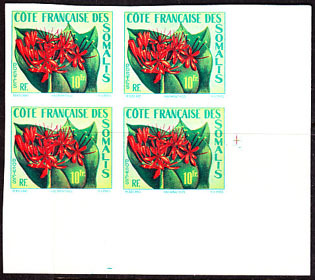 Imperforate corner dated block of 4. Scott No 281, Yvert No 300. 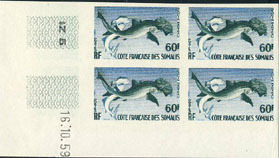 16116 ND SOMALI COAST (1959) Hammerhead shark*. 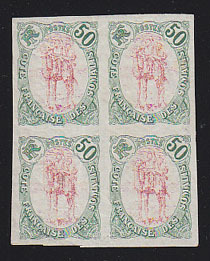 Imperforate corner dated block of 4. Scott No 282, Yvert No 302. 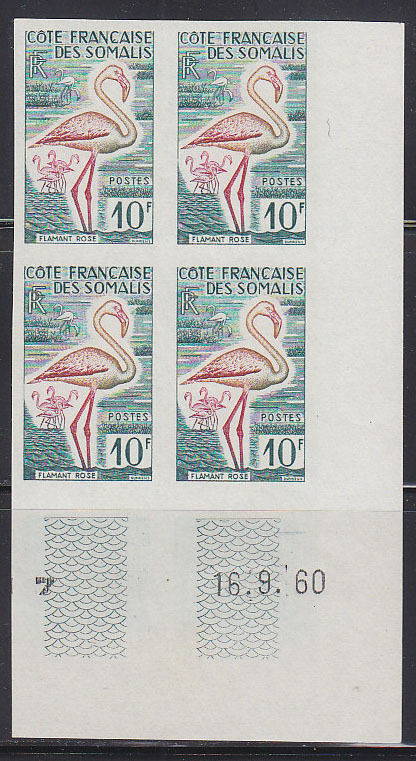 6613 ND SOMALI COAST (1960) Flamingo*. Imperforate block of 4. Scott No 283, Yvert No 297. 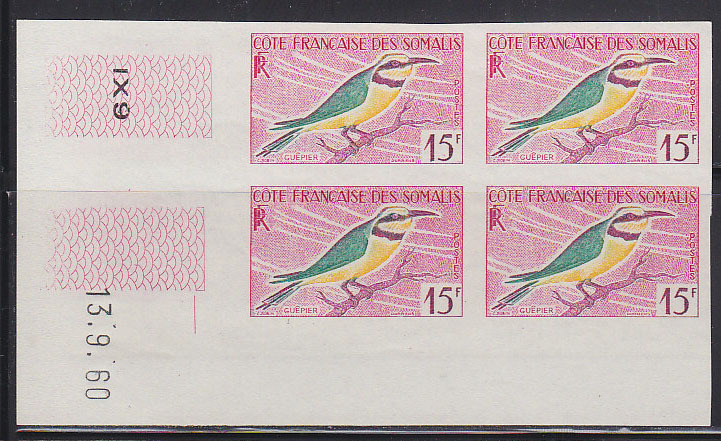 6614 ND SOMALI COAST (1960) Bee eater*. Imperforate block of 4. Scott No 284, Yvert No 298. 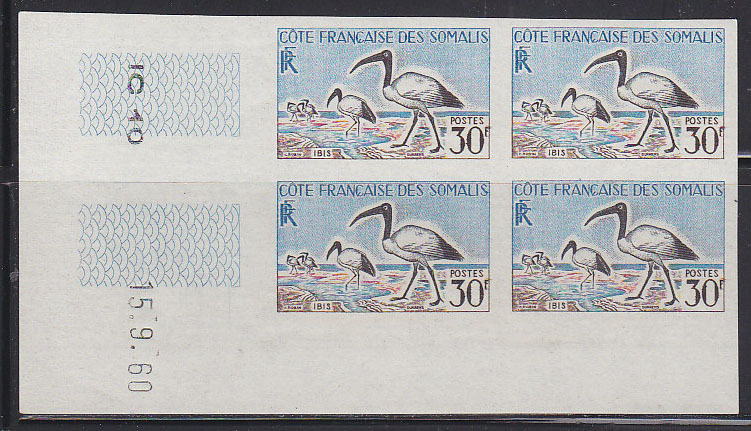 6617 ND SOMALI COAST (1960) Sacred ibis*. Imperforate block of 4. Scott No 285, Yvert No 299. 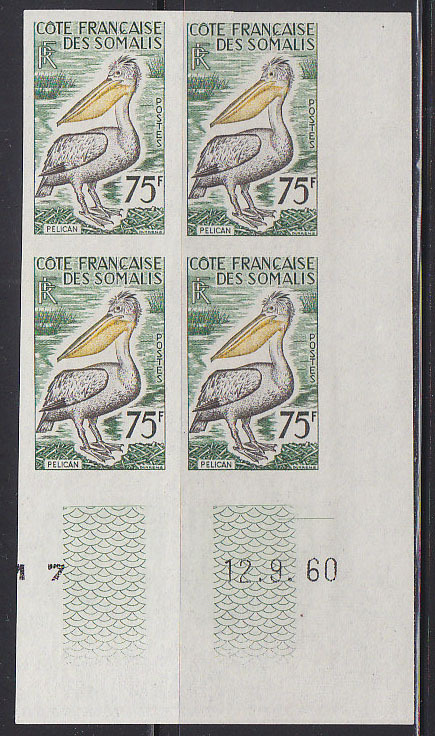 6618 ND SOMALI COAST (1960) Pink-backed pelican*. Imperforate block of 4. Scott No 286, Yvert No 300.